The history of department stores can be traced back to Bon Marché which opened in Paris early in the 19th century. Their growth was closely linked to the increase in the population centres, developments in transportation, and even in part to the invention of the electric light bulb. 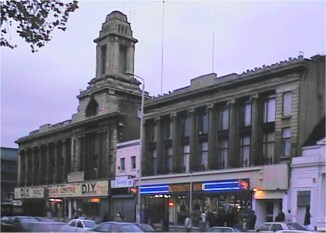 One of the East End of London's major department stores was Wickhams, completed in 1927, on the north side of the Mile End Road. When the old row of shops were being acquired to build the store in the early 1900s, the three Spiegelhalter brothers, who operated their jewellers at no. 81, refused to part with their premises at any price. Although of German descent, the Spiegelhalter family had lived for many years at no. 81 with most of the brothers and their sisters being born there. Their refusal to move led to the odd situation in which the new store was built around the family shop which continued to trade when Wickhams opened on both its sides! Interestingly, the two parts of the Wickhams building form part of a greater design, anticipating the eventual purchase of the jewellers and its incorporation into the whole. 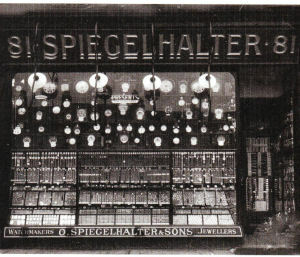 As can be seen from the photographs, the facade of the building is complete right up to the boundary either side of the jewellers with even the column immediately to the right of the jewellers having a flat side, waiting to be completed once the Spiegelhalters land had been bought. On close inspection it can be seen that the central block with its tower would not have been in the centre of the completed building - with the jewellers in the way, the central block has been shifted to the left and the completed building would have had seven windows in the wing to the left of the central block and nine to the right. I wonder if the stonework had been ordered before it became apparent that the Spiegelhalters would not sell and the solution was to erect the right wing shifted to the right by the width of their land. This would explain why the two side wings look very similar, with the central raised feature of the entablature (the piece running over, and supported by, the columns) positioned over the forth window on both sides (once the jewellers had been replaced it would not have been central on the right hand wing) Hmm - we'll probably never know. Completion of the grand design was never to be. The Spiegelhalter brothers had the last laugh for when the era of the independent department stores waned in the 1960s, Wickhams sold up. 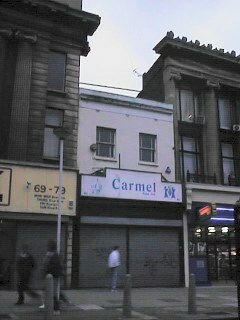 The jewellers changed hands in 1988 becoming an off licence. Text based on information from The East End, Then and Now, edited by Winston G. Ramsey, published by After the Battle, and from Julian Pottage, grand nephew of Leo, one of the Spiegelhalter brothers.